System Mechanic is a package of tools for every kind of PC problems. System Mechanic can fix problems caused by registry crashes and optimize your system for best performance. You can use the one-click Analyze tool to tune up your PC automatically or use PC Accelerator, PC Repair, PC Cleanup and PC Security tools to manually remove useless data from your PC and fix all the internal problems of your system. System Mechanic is an automated program that can automatically cleanup your PC, repair registry problems, optimize startup configurations, optimize internet configurations, fix broken shortcuts, back up your system registry after every 14 days and automatically fix fragmentation-related problems. It also gives you every detail about your security programs and firewalls installed, if there are any. You can use its tools to boost your system manually. You can also configure Windows startup, manage running programs, customize internet settings, find duplicate files and uninstall any installed application using the powerful tools this program offers. System Mechanic can also track any change in your system, measure your Internet speed, monitor hard drive status, securely delete any file, clear Internet cache and history and much more. System Mechanic has an "Intellistatus" tab that gives you a complete report of your system, like running processes, hard disk details, system memory status and other parameters. 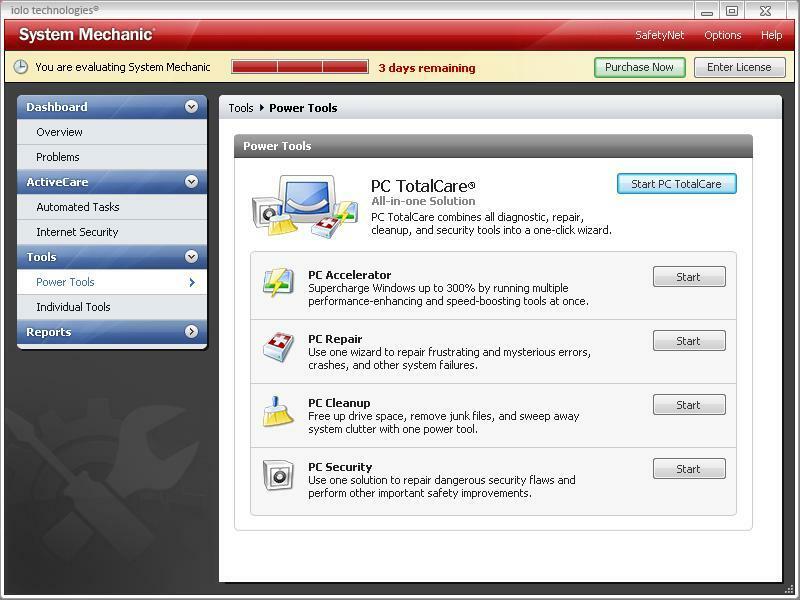 All in all, System Mechanic is a well designed system care application for your PC. Utilities like process manager, uninstaller, startup manager, file shredder, system booster, registry tools, privacy tools and PC accelerator make this software outstand the other programs of its category.